In the southeastern U.S. Coastal Plain, all landscapes can be conceptually divided into aquatic, wetland, and upland habitats. Aquatic and wetland habitats account for a substantial percentage of the Coastal Plain, especially near the coast and in Louisiana and Florida, but overall from southeastern Virginia to east Texas, uplands constitute the largest proportion of the terrain. It has been estimated that, upon the arrival of Europeans and Africans in North America, upland ecosystems dominated by a single tree species, longleaf pine (Pinus palustris), accounted for about 60% of the Coastal Plain landscape (Ware et al. 1993). In other words, longleaf pine ecosystems were the principal ecosystems in a belt of land stretching about 2000 miles along the southeastern margin of the North American continent. Most of the range of longleaf pine was in the Coastal Plain, a gently undulating, lowelevation (0–200 m), sedimentary landform with soils developed from sandy clays (clayhills and some flatwoods) or pure sand (sandhills and flatwoods), sometimes underlain by limestone (Brown et al. 1990; Martin and Boyce 1993). 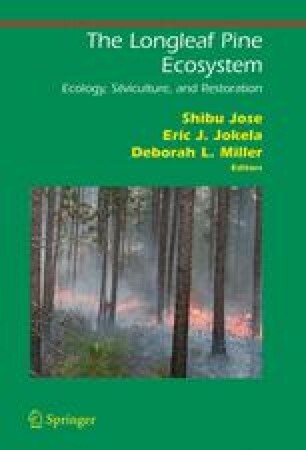 Longleaf pine ecosystems and their vertebrate faunas are the focus of this chapter.